The Grenztruppen der DDR or Border Troops of the German Democratic Republic, were a military force of East Germany tasked with guarding the Berlin Wall and the border between East and West Germany. The Border Troops numbered at their peak approximately 47,000 troops. 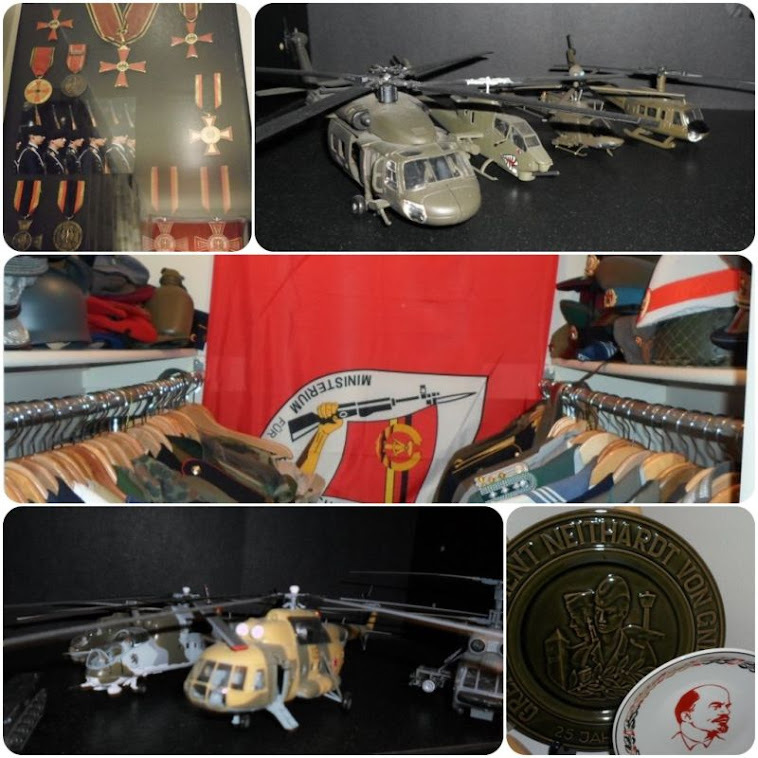 Other than the Soviet Union, no other Warsaw Pact country had such a large border guard force. It's main mission was to prevent East German citizens and government employees, including military personnel, from escaping from the DDR. It's secondary role was to serve as part of the first-line of assault in event of an attack from the West. The Grenztruppen, often nicknamed 'Grenzers' were responsible for many deaths along the Berlin Wall as well as suffering from numerous casualties in the line of duty. By December 1945 within six months of the end of the war each of the five states in the Soviet zone had a central police force, in clear violation of the Yalta and Potsdam agreements. In early January 1946, the term Volkspolizei (People's Police) was applied publicly to the new police forces in East Germany, and in August of the same year these forces were placed under the central control of the newly created German Administration of the Interior, headed by Erich Reschke. In November 1946, the Sowjetische Militäradministration in Deutschland (SMAD) directed the organization of the Deutsche Grenzpolizei (German Border Police), actually formed on 1 December 1946. The initial 3,000 recruits were organized and trained from People's Police resources, and by April 1948 the branch numbered 10,000, the total reaching 18,000 in 1950. The Grenzpolizei were armed and organised like a police force; and were subordinate to the Main Administration of the Border Police and Alert Units of the German Administration of the Interior. 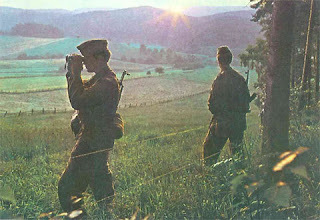 Eventually, the East German regime demanded a reorganization of the force along military lines, similar to their Soviet counterparts, the USSR Border Troops. In 1961, the Grenzpolizei were reorganized as the Grenztruppen der DDR. As part of the reorganization, the Grenztruppen der DDR were moved from the GDR Ministry of the Interior to the GDR Ministry of National Defense (MfNV). Although the border troops were originally part of the National People's Army (NVA), in 1973 they were separated from the NVA and reported thereafter directly to the MfNV. While wearing standard NVA uniforms, the border troops had their own dark green arm-of-service color, and their service and dress uniforms bore a green cuff title with white lettering reading 'Grenztruppen der DDR' on the left arm. From 1973 on, service in the Grenztruppen der DDR was voluntary - no draftees involuntarily served in its ranks after 1973, as opposed to the NVA. 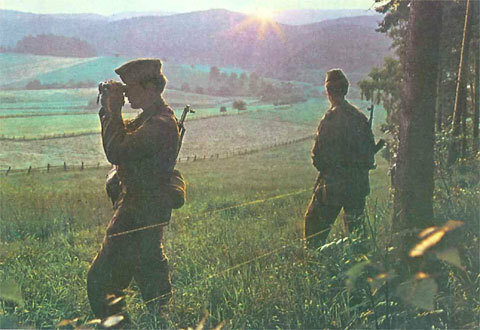 In contrast to the massive efforts along the borders with the West, there were only about 600 members of the Grenztruppen assigned to guard the GDR's borders with Czechoslovakia and Poland. On 1 July 1990, the border control regime along the borders with West Germany and West Berlin was ended. In September 1990, shortly before the reunification of Germany, the Grenztruppen der DDR were disbanded; its border patrol duties along united Germany's eastern frontiers were assumed by the Bundesgrenzschutz (Federal Border Guard). For most visitors to East Berlin and the GDR, including persons who utilized the land transit routes (road and rail) between West Germany and West Berlin, their exposure to the Grenztruppen der DDR consisted of dealing with the members of the "Pass and Control Units" (Paß- und Kontrolleinheiten - PKE) who processed travellers passing through the GDR's Grenzübergangsstellen (border crossing points). Although they wore Grenztruppen uniforms, the members of the PKE were in fact members of the 6th Main Department (Hauptabteilung VI) of the GDR Ministry of State Security (Ministerium für Staatssicherheit der DDR or "Stasi"). The units of the Grenztruppen der DDR were organised in the same manner as ordinary NVA army units. The headquarters of the Grenztruppen der DDR was located at Pätz (a small village southeast of Berlin in the present-day state of Brandenburg), near Königswusterhausen. The Grenzkommando Nord (GKN) (Border Command North), with headquarters at Stendal (in the present-day state of Saxony-Anhalt) was responsible for the northern sector of the East German border. The GKN consisted of six frontier troops regiments, two training regiments, a helicopter flight and some smaller support units. The Grenzkommando Süd (GKS) (Border Command South), with headquarters at Erfurt, guarded the southern border sector. The organizational structure of the GKS was similar to that of the GKN, with six frontier troops regiments, two training regiments, a helicopter flight and some smaller support units. The Grenzkommando Mitte (GKM) (Border Command Center), with headquarters at Berlin-Karlshorst, manned the crossing points into West Berlin and guarded the entire border perimeter surrounding West Berlin. The GKM consisted of six frontier troops regiments, one border crossing point regiment, two training regiments, an artillery regiment and some smaller support units. The Grenzkommando Küste (GKK) (Coastal Border Command), with headquarters at Rostock, deployed a coastal brigade (Grenzbrigade Küste) consisting of twelve marine battalions and several boat battalions and companies to guard the GDR's relatively small coastline along the Baltic Sea. For command-and-control purposes, the GKK was incorporated into the GDR's "People's Navy" (Volksmarine). In accordance with a June 1989 decision of the National Defense Council of the GDR, the Grenztruppen der DDR were extensively reorganized as of 30 November 1989. The personnel strength was reduced by approximately 17 percent, while the number of headquarters units was reduced from 50 to 24. In the place of the previous command structure, six border district commands (Grenzbezirkskommandos), 16 border county commands (Grenzkreiskommandos) and two border training centers (Grenzausbildungszentren) were created. The Grenzbezirkskommandos reported to the national headquarters. The two training centers reported directly to the national headquarters, along with the training schools for Grenztruppen officers, officer candidates and NCOs. Upon reunification the Grenztruppen were controlled by Bundeswehr. The border guards' numbers were rapidly reduced. Half were dismissed within five months of the opening of the border. The border was abandoned and the Grenztruppen were officially abolished on 1 July 1990. All but 2,000 of them were dismissed or transferred to other jobs. The Bundeswehr gave the remaining border guards and other ex-NVA soldiers the task of clearing the border fortifications, which was only completed in 1994. The scale of the task was immense, as not only did the fortifications have to be cleared but hundreds of roads and railway lines had to be rebuilt. Border Troop regiments were trained similar to regular infantry, but were much more lightly equipped than comparable NVA infantry formations, with the heaviest weapon being the RPG-7 grenade launcher. To increase their capability to search for persons attempting to flee the GDR, most units had German Shepherd dogs. A regiment consisted of around 1,500 men divided into three battalions of four companies each. These regiments also had an anti-tank battery, a mortar battery and an engineer company. The units of the Grenzkommando Mitte were mechanized, with PSzH-IV and FUG armoured vehicles. Training for Grenztruppen soldiers was provided by the four training regiments; after the reorganization of 30 November 1989 (see below), the four regiments were consolidated into two training centers. Training for noncommissioned officers was held at the Unteroffiziersschule der Grenztruppen der DDR „Egon Schultz“ in Perleberg. Training for dog handlers was conducted in Wilhelmshorst. Grenztruppen officers and officer candidates were trained at the Offiziershochschule der Grenztruppen der DDR „Rosa Luxemburg“ in Suhl (previously located in Plauen). Undoubtedly the most controversial aspect surrounding the Grenztruppen der DDR concerns those who were killed or wounded while attempting to flee East Germany into the West. Even today, the topic of the "shoot-to-kill order" (Schießbefehl) is quite sensitive in Germany, East and West. According to information released by the "Working Group 13th of August" (Arbeitsgemeinschaft 13. August e.V.) on 13 August 2004, 1065 persons were killed along the GDR's frontiers and coastline, including 37 Grenztruppen soldiers killed during escape attempts. Many more were wounded. The Berlin Public Prosecution Department estimates that about 270 'proven' deaths on the border were due to acts of violence by GDR border security guards, including deaths caused by mines and automatic firing devices. However, the Central Assessment Group for Governmental and Organized Crimes (German: ZERV), which existed from 1991 to 2000 as a branch of the Berlin Police, registered 421 suspected cases of killings by armed GDR border guards. To encourage the troops, the GDR government gave distinctions, extra liberty and premiums to a soldier who had used his gun in earnest at the border. If he had killed a refugee, he got a gold watch, but was also transferred to another unit to avoid bullying from his own unit buddies. The Grenztruppen also maintained it's own Air Patrol tasked with assisting Border Guard ground units with air support, especially fly-over surveillance. The approximate size of the unit is unknown but it's personnel wore the same uniform as standard Border Guard personnel but were distinguished by the wear of green Air Force style collar tabs.